Once you are setup for range day, it’s time to remember one important thing: This isn’t dad’s range day. It’s for the kids. 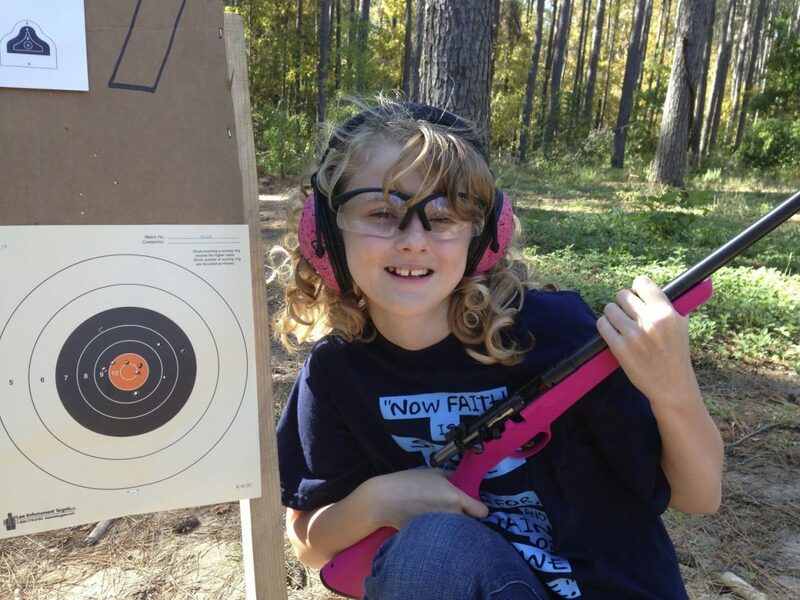 You attention needs to be fully on them, helping them stay safe and enjoy shooting. While it’s so tempting to just pick up the rifle and blast away with them they need your attention and patience. 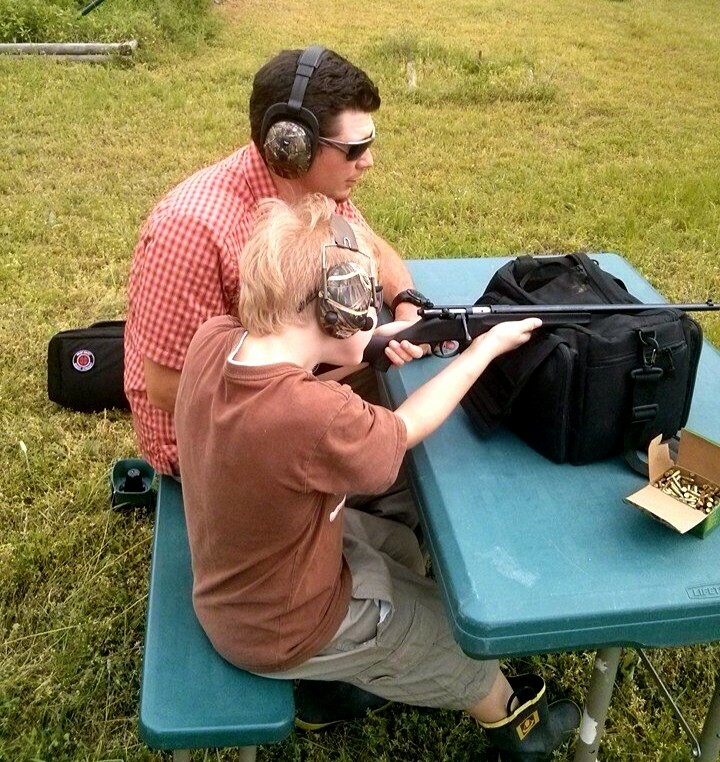 Uncle isn’t shooting, just watching and teaching. Start close. Start with large targets. Ten to thirty feet may look way to close to you, but this will instill confidence in their ability and allow you to diagnose any issues on startup. Missing the entire target is a complete bummer, so start close. They might start off with a one hole group – Great! Now it’s time to move back. Start close and instill a sense of confidence and achievement. Reactive targets are also a great idea. Steel is awesomely satisfying. Cans or plastic bottles full of water are also a lot of fun and demonstrates the power of hydrostatic shock much better than holes in paper. Ice is also a great target that requires no cleanup. At camp we freeze dyed water in solo cups and drop the ice out at the range. Small vaporizing/reactive targets like Ghost Targets and Smoke ‘Em targets are also fun and unique. Avoid using expert shooting terms like scope parallax, eye relief, cheek weld, trigger press, and others. When I explain a smooth trigger press to young students I use terms they can visualize. For instance, on trigger press I have them imagine diabolically squishing a tiny marshmallow by increasing pressure until all the marshmallow guts squeeze out. Then they can apply visual pictures like that to their shooting. Proper form will come later on when they are more comfortable and experienced. I allow my 5 year old to shoot his .22LR Rascal with the stock in an unconventional position because he’s still too small to hold it properly. As long as it’s safe, I just let him have fun. We can tweak form when he’s ready. I avoid giving handguns to kids altogether. The short muzzle and lack of stock make them a high risk for unexperienced shooters. I usually don’t allow anyone under 14 years old to shoot a handgun with me, and then, once again, it’s baby steps. NLT SIRT trainer, BB pistol, single shot six shooter rimfire and working up from there.